A breath of fresh pianistic air. No bugs. A deep breath of fresh air. “Through An Open Window” marries exceptional composition with pure skill reveling in a two-way street of musical talent. Hand picked by Igor himself to perform at the International Stravinsky Festival, Ms. Wenger’s talent has been recognized by the masters. So it’s hardly surprising that Ms. Wenger would continue her charge with this particular cast of composers. Paul Schoenfield’s “Six Improvisations on Hassidic Melodies” takes melody to new heights of expression in the ancient tradition of Hassidic folk music. Joy, exuberance, reflection, ecstasy – listeners are spared none of the intangible facets of this very mystical music. Janice Giteck’s “Tara’s Love Will Melt the Sword” keeps with the heartfelt mystical tone of this record. The piece is dedicated to two female manifestations of Buddha and is purposely constructed as modest and intimate meditations. Bill Rea continues his iconic and eclectic stylings with “A Dissimulation of Birds.” Based on ancient hunting terms for birds in The Book of Saint Albans, these pieces are colorful and poetic in nature and lend themselves to improvisation. Like birds themselves, they are free with movement but purposeful in direction. Commissioned by and dedicated to Lucy Wenger, Bill Rea also offers “Variations on an Irish Song” at the close of the record. Based on the song “Down by the Salley Gardens” with poem by William Butler Yeats and tune by Hubert Hughes it is a symbolic and literal look back on lost chances and missed moments. The piece is constructed by changes in harmony, time, tonality and texture - beginning and ending with simplicity but erupting in movement and imagery along the way. Good storytellers are often influenced by diversity. As a composer, Alan Hovhaness was no exception. East meets West and everything in between in his works. With harmonies organized modally rather than tonally, Hovhaness’ style was centered around tone. The Sonata “Fred the Cat” is a miniature piece (six minutes) of three movements. The entire sonata is a simple and elegant oeuvre to a feline friend. “Through An Open Window” combines all the necessary ingredients, and then some, of a rich listening experience. Warm, lyrical yet intense piano and the compositions to do it justice – all put together and produced by Grammy award winning producer of the year David Frost. 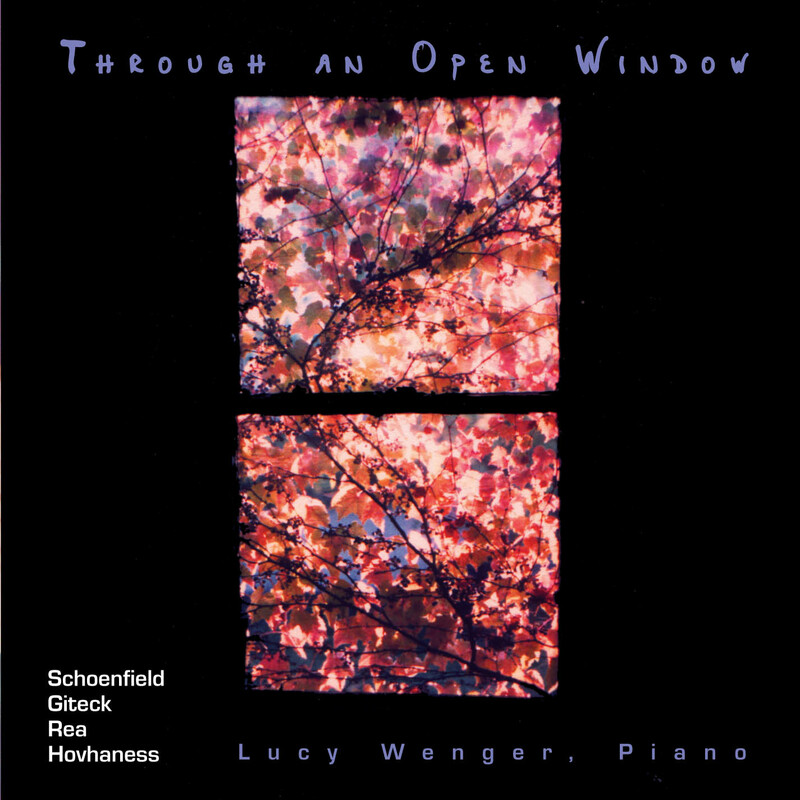 “Through An Open Window” is a fascinating collection of suites of piano solos by four contemporary American composers and performed to perfection by Lucy Wenger. The music varies from melodic and rhythmic to atonal and abstract, and yet the CD holds together well as a cohesive listening experience. Most of the thirty-three pieces are relatively short, providing a sampler of each composer’s work and showcasing Wenger’s extraordinary playing. This CD is very definitely contemporary classical music, so if you are looking for “ear candy” or massage music, this will probably not be a good fit. Some of the music could be challenging for the casual listener, but more serious music lovers will have much to savor and enjoy. Highly recommended to those who enjoy and appreciate contemporary classical piano.